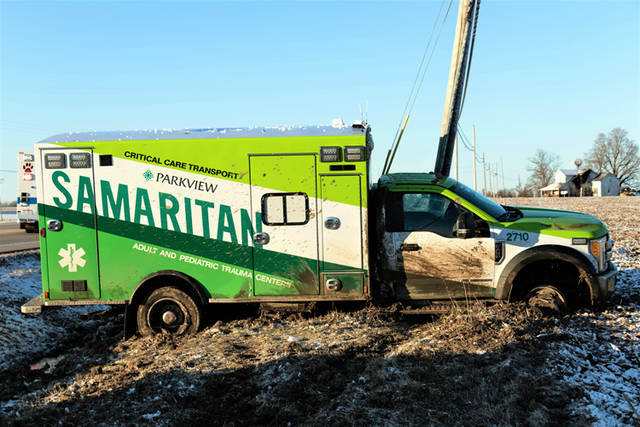 An ambulance based out of Fort Wayne, Indiana, drifted off the right side of the roadway and struck a utility pole before it came to rest at the edge of a field. GREENVILLE — An ambulance carrying a juvenile patient and their mother was involved involved in a single-vehicle accident Sunday morning outside of Greenville. At approximately 7:05 a.m., emergency personnel from Ansonia Fire and Rescue along with deputies from the Darke County Sheriff’s Department were dispatched to the 9200 block area of U.S. Route 127 in regards to a single-vehicle accident with possible injuries. 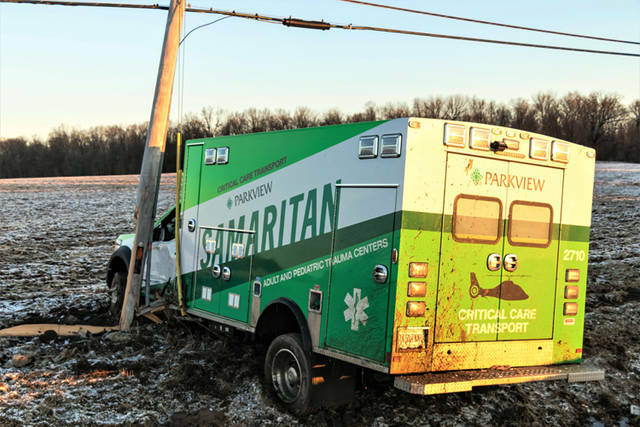 According to the Darke County Sheriff’s Department, preliminary investigations into the accident revealed that a Parkview Samaritan critical care transport ambulance, owned and operated by Parkview Regional Medical Center out of Fort Wayne, Indiana, was southbound on U.S. Route 127 when it drifted off the right side of the roadway. 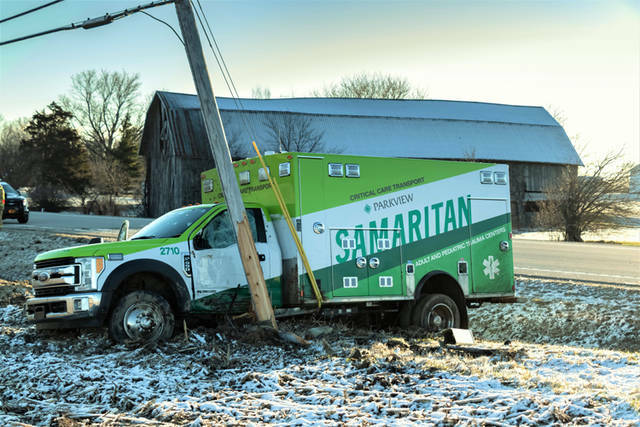 The 2017 Ford F-450 ambulance, driven by Richard Tutwiler, 50, of Fort Wayne, came into contact with and broke off a utility pole before it came to rest at the edge of a field. 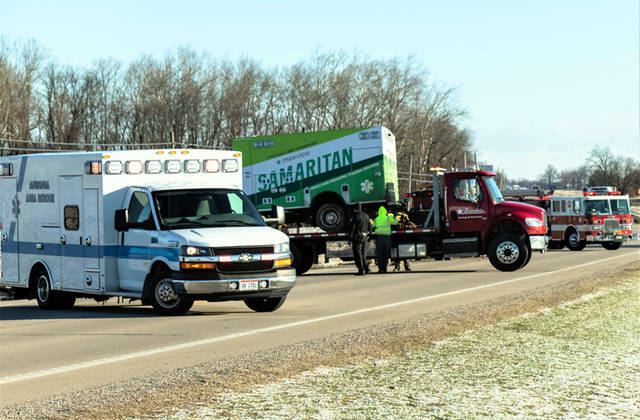 The ambulance was carrying two crew members — Tutwiler plus Shanna Hawn, 26, of Fort Wayne — and a 9-month-old patient with a parent, Emily Ross, 19, of Fort Wayne, at the time of the accident. The juvenile patient being transported along with the mother were examined on the scene by Ansonia Rescue and found to be uninjured in the accident. The care of the patient was transferred to Ansonia Rescue, who continued the transport of the juvenile and the parent to Cincinnati Children’s Hospital. The driver and crew member of the ambulance also were examined on the scene by EMS and refused treatment and transport to a medical facility. According to its website, Parkview Samaritan Air and Ground Transport services, which operates from Parkview Regional Medical Center out of Fort Wayne, Indiana, began air transport services in November 1989 and later added mobile intensive care and critical care ground services in the fall of 2010. Parkview Samaritan received international accreditation by the Commission on Accreditation of Medical Transport Systems in 2016 that demands a record of high safety and care standards for both air and ground transport services. The Samaritan program is one of only five programs to receive the accreditation in the state of Indiana for maintaining a high safety and care standard. This entry was tagged ambulance, Ansonia Fire and Rescue, Ansonia Fire Department, Ansonia Rescue, Cincinnati Children’s, Cincinnati Children’s Hospital, crash, Darke County Sheriff’s Department, Darke County Sheriff’s Office, Fort Wayne, Indiana, Parkview Regional Medical Center, Parkview Samaritan, Parkview Samaritan Air and Ground Transport services. Bookmark the permalink.